It was great to be a part of Holiday CircleFest on December 4. This annual event is a terrific opportunity for families to spend quality time together. University Circle cultural and educational institutions opened their doors free of charge and provided wonderful and creative activities for all—storytelling, music and everything in between. The Maltz Museum of Jewish Heritage brought the “festival of light” to Wade Oval. Our friends at the Cleveland History Center generously invited us to set up in their rotunda. 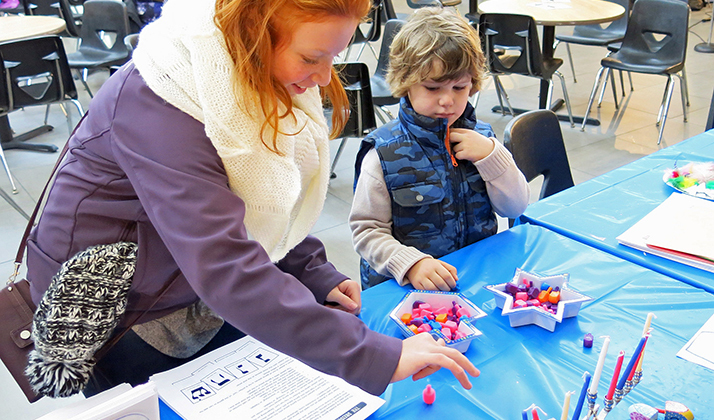 We spent the day helping children make sweet candy dreidels and design Hanukkah menorahs that incorporated the outline of their own hands. I had a great time talking about Jewish holiday traditions with people of all ages and backgrounds. A woman of Italian heritage and I compared our family experiences. It was interesting to see what we share when it comes to celebrations. If you missed CircleFest, there are still other free family-friendly celebrations coming up including MENORAH LIGHTS: GENERATION TO GENERATION (Tues., Dec. 27, 1 – 3pm @ Menorah Park). Whether it’s a dreidel passed down from generation to generation or a gift given to commemorate a newly married couple’s first Hanukkah together, many of us have objects that hold special meaning for our families. Our stories come to life when we share them with others. We’re inviting the community to bring and share their Hanukkah treasures with others during this community storytelling event. The afternoon also includes shopping and music. Click here to learn more. Children of all faiths and backgrounds are also invited to FRIENDS OF THE MALTZ MUSEUM’S HANUKKAH CANDLELIGHTING (Wed., Dec. 28, 5 – 6pm @ Maltz Museum). Museum volunteers plan this annual event which includes songs, crafts, a scavenger hunt, a telling of the Hanukkah story and a sweet cookie reception. There’s no cost, but reservations are strongly recommended. I’m excited about these events because I believe we must keep our traditions alive in order to maintain our rich history for generations to come. I also feel strongly that sharing and learning from others who are different from us is the only way we can create a peaceful world to pass on.